Historically, gynecologic endoscopy began in the 1930s with the development of diagnostic laparoscopy, but today gynecologic endoscopy, both laparoscopy and hysteroscopy, has become an essential part of gynecologic surgery. In present practice, the benefits of laparoscopy, hysteroscopy, and minimally invasive surgical procedures have become safely entrenched behind undeniable facts, to the patients as well as the hospitals. The endoscopic gynecologic surgery now involves the whole gamut of fetal surgery, embryoscopy, outpatient local anesthetic laparoscopy, total laparoscopic hysterectomy, and embolization of myomas. Another interesting fact to come to the fore is that, increasingly, the traditional treatments for infertility are being rendered obsolete by advanced reproductive technologies and gynecologic endoscopy. 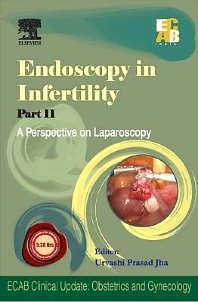 Endoscopy in Infertility has addressed the relevant issues with dexterity by substantiating with relevant clinical experiences of its authors, who are among the pioneers in this field. Director, Obstetrics & Gynaecology & Surgical Oncology, Max Healthcare, New Delhi.